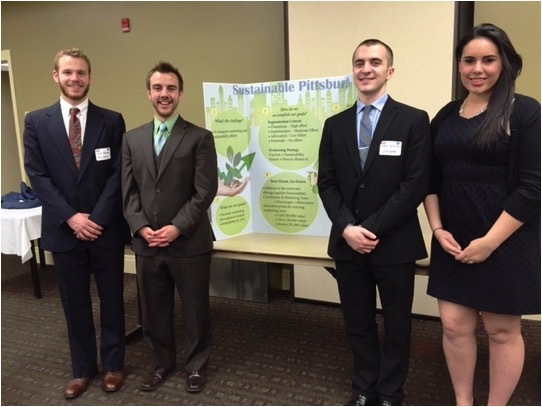 The Pittsburgh AMA Marketing Plan Competition culminated Friday, April 10th at the Sewell Center of Robert Morris University with 9 teams from 5 different universities competing with their plans for Sustainable Pittsburgh. Six judges and Matt Mehalik from Sustainable Pittsburgh donated their time to scoring the plans and interacting with the students. Our judges reviewed each teams plan, poster and presentation (150 points total) ultimately determining the three award winning teams who received bragging rights along with $300 for First place, $200 for Second place and $100 for Third place. 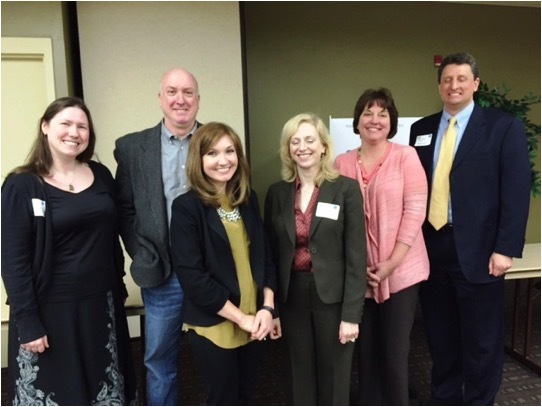 Thanks to our esteemed judges –marketing professionals who gave generously of their time to connect and support these student efforts. Judges (left to right) Bethany Brown MSA, Steve Sarfin MedExpress, Angela Fergusen Giant Eagle, Lynda Nyman Penn Brewery, Pam Koren McDonalds and Matt Mehalik Sustainable Pittsburgh. 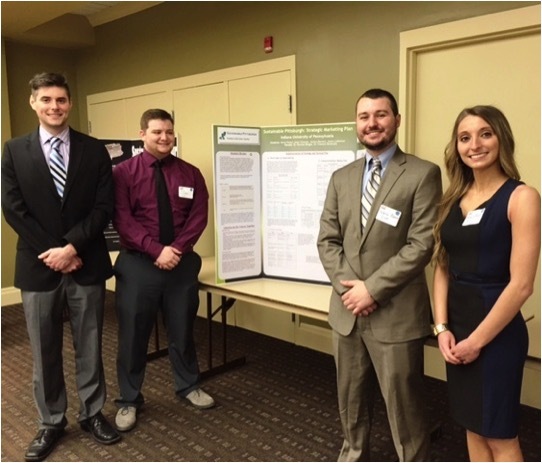 First Place Team from WVU with flanking Michael Walsh, Ph.D. 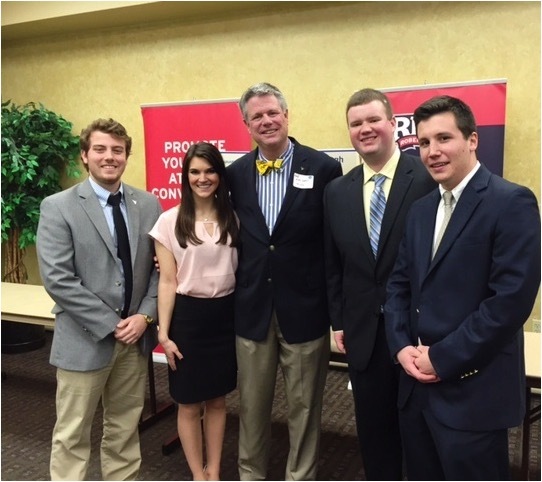 Chair and Associate Professor of Marketing WVU are team members Matt Elder, Jessica Petrina, Mark Byrne and Tanner Assimos. 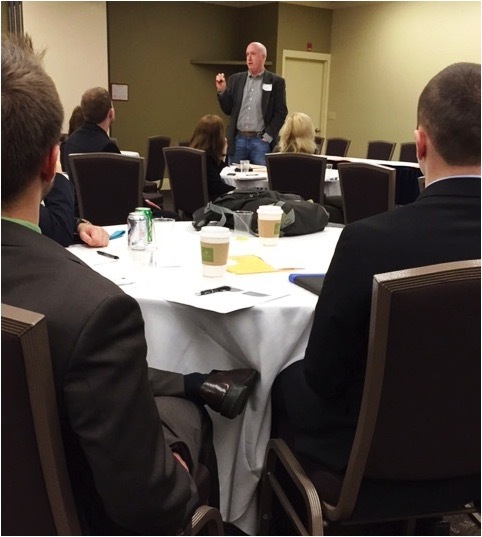 Steve Sarfin, VP of Marketing at MedExpress gives feedback to the student teams. 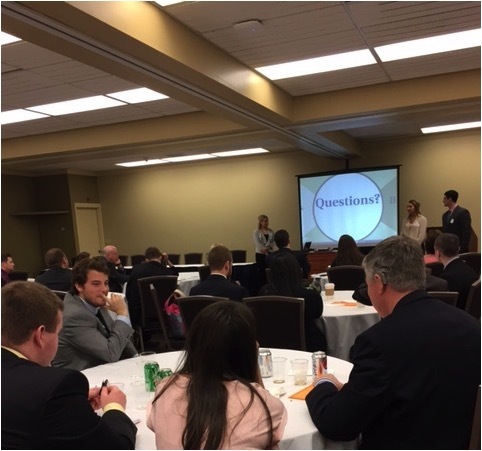 Student teams from University of Pittsburgh, Slippery Rock University, Robert Morris University, Indiana University of Pennsylvania and West Virginia University competed in the AMA Collegiate Marketing Plan Competition.